Jenn and Robert were dating for over 31/2 years before they got married. They first saw each other on match.com and actually found one another on Facebook, which is how they started talking. After dating for a few years, they went the Hartford hill winery with their parents and he took her by the pond, sat on the bench, and asked her to marry him in front of their families. They were married on sweetest day, October 21st, 2017.The day started off with the bride and bridesmaids getting their hair and make-up done and getting ready at Jenn and Rob's house in Cortland, Ohio. The groom and the groomsmen got ready at his parent's house in Cortland, Ohio. Their ceremony took place at St. Robert's Catholic Church in Cortland, Ohio. After the ceremony, we headed to the reception venue, which was The Place at 534 in West Farmington, Ohio, where we took the family formals, bridal party portraits and the bride and groom portraits. The Place at 534 was such a beautifully decorated location, where the couple took have had an all-inclusive wedding day, with the ceremony and reception all in one venue. The Place at 534 even has the woods behind the venue decorated. 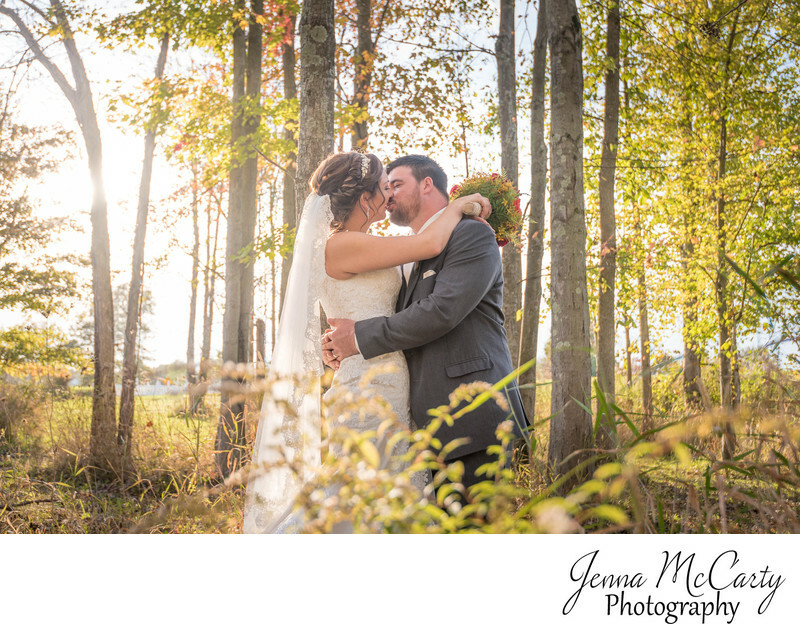 This photo features the bride and groom kissing in the woods with the sun setting on their perfect fall wedding day. Location: 4230 G P Easterly Rd, West Farmington, OH 44491.